Republican leaders in Congress Tuesday celebrated school choice, an idea that’s likely to get more traction in Washington given the GOP’s universal control of the federal government and the nomination of a staunch school choice advocate as education secretary. The fate of that nominee, Betsy DeVos, turned the National School Choice Week gathering at the Capitol Visitors Center into something of a pep rally for the billionaire philanthropist whose confirmation hearing and committee vote have both been postponed amid Democratic opposition. “Our Senate Democrats are in a fit because President Trump has nominated a nominee for U.S. education secretary who spent the last 30 years trying to help low-income parents have the same choices of good schools that wealthy people already have,” said Sen. Lamar Alexander, chairman of the education committee and responsible for seeing DeVos’s nomination through to confirmation. “It’s hard for me to understand why anyone would be against that,” he said. DeVos’s nomination has been strung out while Democrats question her extensive financial and ethics disclosures, criticizing what they perceive as conflicts of interest while arguing that her longtime advocacy for private school choice could undermine public schools. DeVos has also been under fire for stumbling on Democrats’ questions at the hearing about the rights of special education students, gun-free school zones and how student learning is measured. Many speakers touched on the American ideal that anyone can rise above humble beginnings, aided by a good education and hard work. “Education is the closest thing to magic in America,” said Rep. Tim Scott of South Carolina, who organized the event with Rep. Luke Messer of Indiana, who served as emcee. “This is a good day,” said Scott, who introduced DeVos at her hearing last week, “and there will be more and more opportunities” to open new options for private choice. 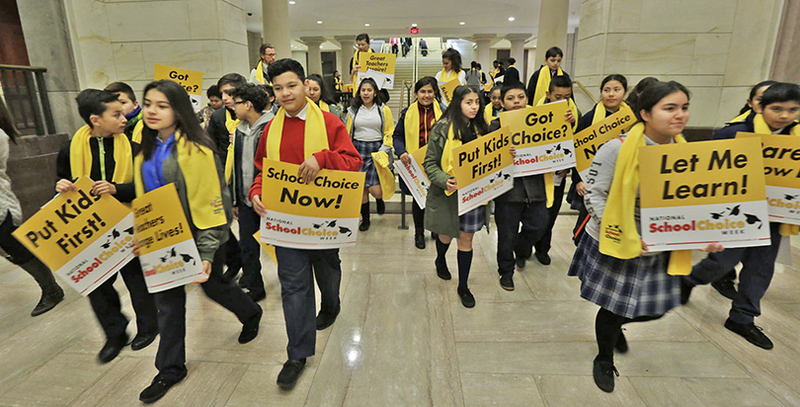 The rally, one of more than 21,000 events held across the country to mark School Choice Week, was attended by several dozen students from local charter and parochial schools. Marco Clark, founder of the Richard Wright Public Charter School in southwest D.C., led the kids in a call-and-response chant of “I’m excited about school choice because I have a voice” with the help of a beat-boxing math teacher. There were speeches by other members of Congress, parent advocate Tillie Elvrum and Malik Washington, a senior who attends Archbishop Carroll High School through the D.C. scholarship program. Washington, who with his sister is being raised by a single mother working a minimum-wage job at night, has been accepted to several colleges, including Penn State and George Mason. Ryan said the D.C. Opportunity Scholarship Program, which is authorized by Congress and provides vouchers for low-income students in Washington to attend private and parochial schools, would be a priority for the upcoming year. Continued GOP control of the House and Senate and Trump’s surprise election have opened up possibilities for new federally funded school choice programs, from tax credit scholarships to grants to boost the creation of new private schools, to changes to the long-standing Title I program for poor students. Alexander said he’d continue to push for his “Scholarships for Kids” act, which would block-grant $24 billion in existing federal K-12 funding that states could use to create vouchers for low-income children to attend the school of their choice. “In the Senate, we got 45 votes for that [as an amendment to the Every Student Succeeds Act]. We need 60. We’re going to keep fighting,” he said. As he did at last week’s hearing, Alexander argued that school choice is in the mainstream of both political thought and popular opinion. He pointed out that it has existed in higher education since the 1940s, when the GI Bill let returning soldiers attend the college of their choice on the government’s dime. “This idea is hardly new, and it’s hardly subversive,” yet it’s “what Senate Democrats are so busy criticizing Betsy DeVos about,” he said. Alexander has rejected Democrats’ call for a second hearing on DeVos, and the committee vote is expected to take place January 31.